Leaf: largest generally oblanceolate, teeth coarse, bristle-tipped. Flower: calyx (except bristles) > 3/4 corolla tube, lobes bristle-tipped; corolla weakly to strongly bilateral, 8--15 mm, generally white to pink, upper lip 3--7 mm, generally 1/2--3/4 tube, > stamens, lobe bases maroon-streaked, lower lip 2--5 mm, lobe tips generally acute. Ecology: Common. Desert washes, flats, slopes, sandy to gravelly soils; Elevation: generally < 1800 m. Bioregional Distribution: sw SnJV, s SCoRO (Cuyama Valley), SCoRI, WTR, SNE, D; Distribution Outside California: to southwestern Utah, western Arizona, northern Mexico. Flowering Time: Mar--Jun Note: Weakly bilateral forms self-pollinated. 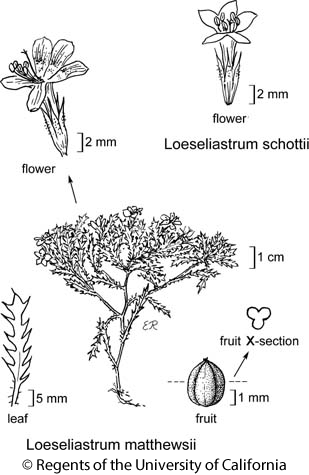 Citation for this treatment: Dieter H. Wilken & Steven L. Timbrook 2012, Loeseliastrum schottii, in Jepson Flora Project (eds.) Jepson eFlora, http://ucjeps.berkeley.edu/eflora/eflora_display.php?tid=31361, accessed on April 19, 2019.
sw SnJV, s SCoRO (Cuyama Valley), SCoRI, WTR, SNE, D; Markers link to CCH specimen records. Yellow markers indicate records that may provide evidence for eFlora range revision or may have georeferencing or identification issues. Purple markers indicate specimens collected from a garden, greenhouse, or other non-wild location.